Sound hole label reads: "Louisville Lou" below that a serial number, then "Distributed in Louisville, Ky."
"...The ukulele is named after me, MaryLou Stout Dempler, known as the Ukulele goddess and Kentucky's Ukulele goddess. For exact information go to my website www.allmarylou.com. For all my uke books published by Mel Bay go to www.allmarylou.com For the uke books I wrote for Lanikia ukuleles, a book is given with every uke purchase around the world, go to www.hohnerusa.com or www.lanikaiukes.com For all uke cd information go to www.cdbaby.com The ukulele was made overseas and an independent music store here in Louisville, KY added the labels ( to name the uke after me), gave the uke a professional set up including professional strings and was sold with a black and red gig bag for $134.00. 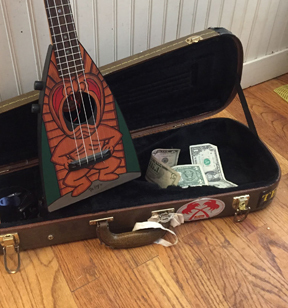 Only 100 Louisville Lou ukes were created and sold..."
There is also 1923 song "Louisville Lou (that Vampin' Lady)" by Milton Anger and Jack Yellen.